All keywords associated with a publication are displayed in the overview tab of the inspector window. 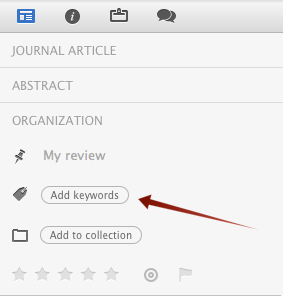 If you don't have any keywords associated with a publication click 'Add keywords' in the overview tab. You see a list of all the keywords that you currently have in your library. If you want to add an existing keyword to a publication, click on the keyword and a tick mark appears next to the keyword indicating that the keyword is now associated with the publication. 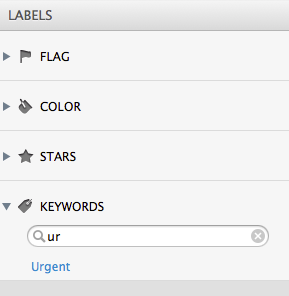 If you have a long list of keywords, use the filter bar to narrow down the keyword that you want to include. If you want to create a new keyword, type the keyword that you want to add to the filter bar and hit the "+" sign to add it. 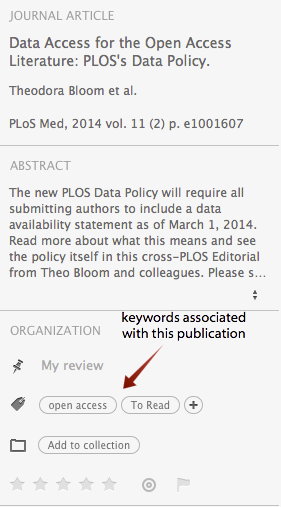 Note that the plus sign only appears once you type in something that doesn't already exist as a keyword. 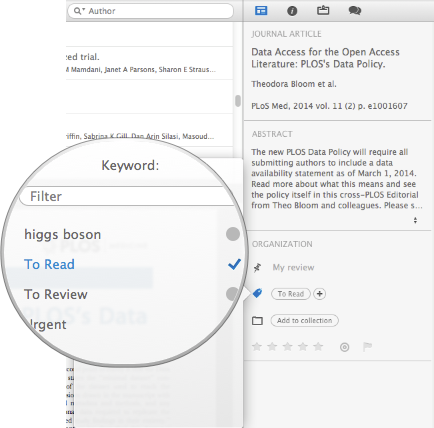 You can search your Papers library by keywords. 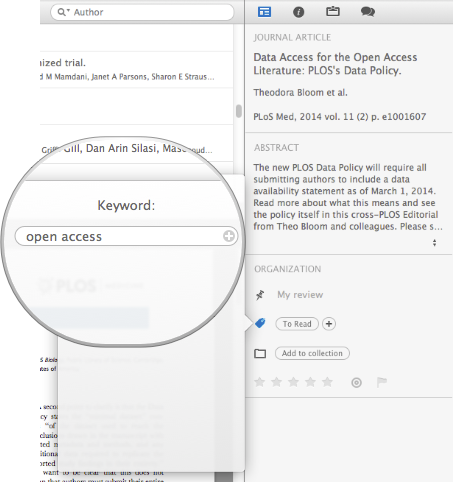 To do so, click on the arrow next to the library search bar and choose 'Keyword' from the drop down menu. You can view all publications associated with a certain keyword in the Labels screen. Use the filter bar to narrow down a specific keyword from a long list of keywords. To edit or delete keywords, select a keyword that you want to edit/delete from the list and click on the 'settings' icon (at the very bottom of the left hand list) and select edit or delete keyword. 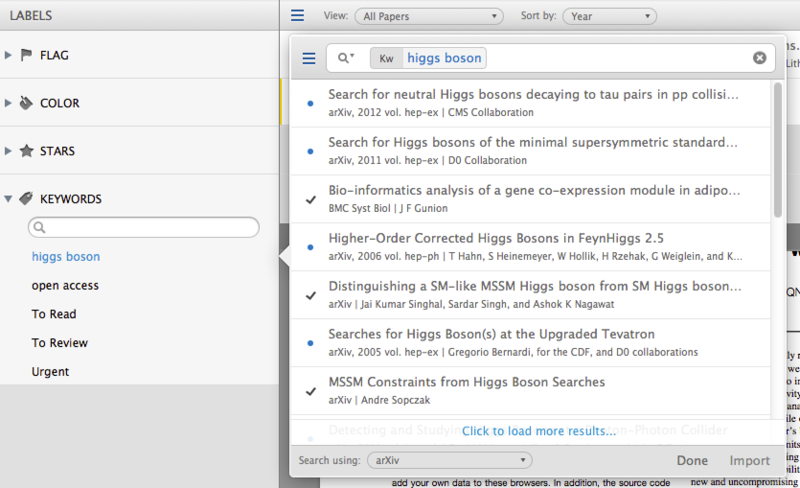 You can also search for recent publications based on a selected keyword. 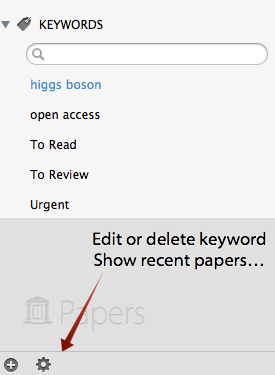 To do so, select a keyword and click on the 'settings' icon to choose 'Show Recent Papers'. Alternatively, hover your mouse next to the keyword to reveal a search loop.